So as you know we announced our exciting news with a YouTube Video last week if you haven't seen that yet find it over at "Clare Elise Sparkles YouTube Channel". We had great fun filming and editing together and after having such great feedback we've actually decided to do a pregnancy vlog following our journey out here in Dubai so that we can keep you up to date. Also a fellow blogger +Liparazzi1 recently had a little baby boy, I'd like to say a HUGE congratulations to them and I'd like to thank her for sharing her baby bump updates and inspiring me to do my own. So here's how it will go... from now on, on a Thursday, you can expect a picture and post on the sparkly blog and brand new sparkly YouTube Video on my channel each week... so please click subscribe. 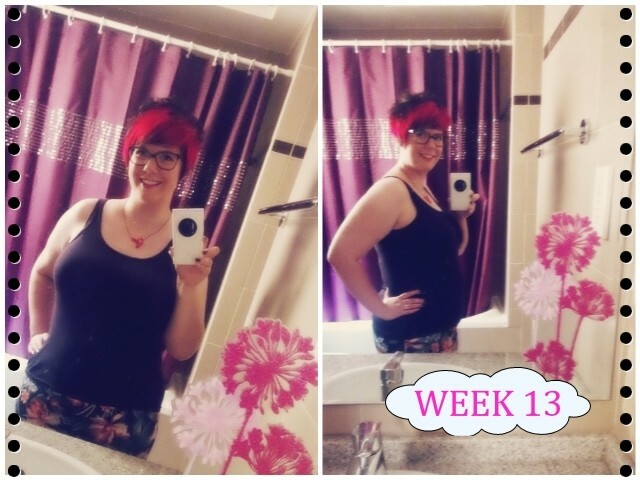 13 weeks just going into week 14 today according to my dating scan. Yup! As you will see from our YouTube Video this week I gave in and popped on a pair of trousers from Heavenly Bump! The trousers are slightly big right now... but oh so comfortable! None at the moment. I invested in a pure Shea Body Butter which I use every evening before bed and in the day I'm currently using a body butter from The Body Shop. I'm sleeping really well right now ... the only thing that has disturbed my sleep though for the last two weeks is this sinus infection and a cough... but I'm much better now. Having Iftar at The Peppermill Restaurant with Chris. It was a lovely meal and it was nice to have some quality time together. Nope all is really good. None. I'm feeling really good except for the sinus infection. The weekend and presenting "80's 90's and nothing else."